Picture crystal clear turquoise seas to snorkel and swim in, a smooth white pebbled beach to laze on and hidden caves and rock pools to discover. The final touch is enjoying a sundowner, after an early evening swim whilst watching a spectacular moon rise over the nearby Albanian mountains, this is the essence of Kaminaki. Easily missed on this famous "Kensington on sea" North East coastline, the tiny undiscovered hamlet of Kaminaki is found down a steep track. With only two tavernas, it is the perfect spot for those seeking peace and quiet and who enjoy a relaxing holiday dipping in and out of the sea, catching up on reading a favourite book or people watching in a local taverna. The route to Kaminaki descends through olive groves and ends at a pebble beach with the gin clear water for which the East coast is famous. The bay is safe for families and ideal for budding snorkelers. It is the perfect spot from which to explore the unspoilt nearby beaches by small boat. It also provides an excellent base for walkers wishing to explore the coastal paths towards the more commercial bays of Agni and Kalami. Sea taxis can be booked for an evening to take you further afield to Corfu town or locally to nearby bays. A local bus also runs from the main road to Kassiopi and Corfu town. 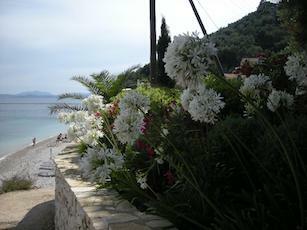 There are only two quiet beachside tavernas, offering mouth-watering home cooked food. The more popular run by Spiros and family is situated on the beach. Further away on the main road there are other tavernas offering a more lively atmosphere with Greek music and dancing. The nearest supermarket is in Nissaki on the main coast road who does deliveries and brings the fresh bread daily. 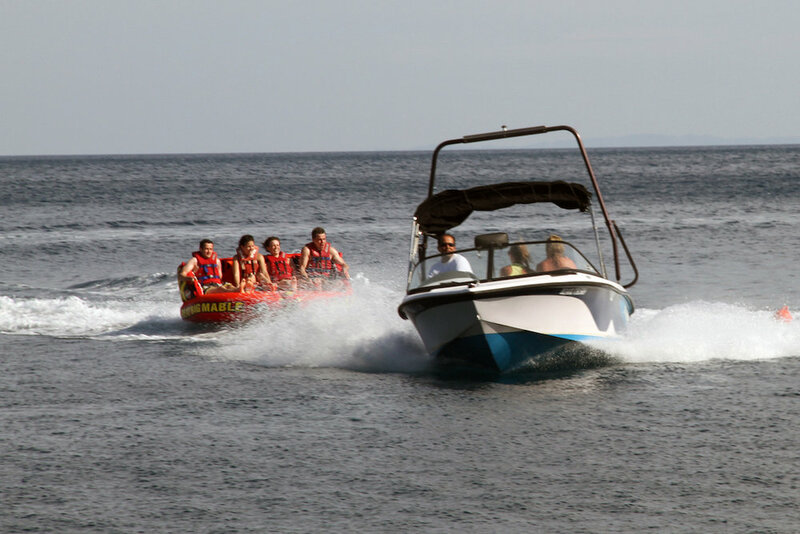 Many take advantage of their rental boat making expeditions to Ipsos and Kassiopi and do their shopping at the same time. Kaminaki is a hard place to leave, but if you wish to explore the delights of the myriad coves, or have some fun, our friends Dimitri & Anna rent boats and run water sports, fun for all ages, from the jetty. Boat or car hire is recommended, but not essential. There is a local bus service from the main road to Kassiopi and Corfu town, where you will find nightlife should you seek it. Kaminaki is 25km from Corfu airport - transfer time approximately 40 minutes.